Persimmons, with their colorful orange fruit and their interesting bark, are lovely trees. If you want to plant a persimmon tree in hopes of getting fruit, make sure you have a male and female tree planted in your yard for cross pollination. Also, most persimmon trees are hardy for USDA zones six through ten. There are many varieties of persimmon, from American to Asian. Japanese varieties like Fuyu or Hachiya are some of the most popular for home gardeners. Choose a place to plant your persimmon trees. Persimmons like full sun, but they can handle partial shade if the temperatures get high in the summer. Test your soil's PH. Persimmon trees favor a PH of about 7. Add lime to your soil if it is too acidic. Work the lime in to a depth of about four or five feet before you plant your persimmon trees. Plant your persimmon trees. Dig a hole one foot deeper than the planter the trees came in, usually about three or four feet deep and four feet in diameter. Place the persimmon trees in the hole, and cover them with soil. Water immediately for five to ten minutes to allow the water to soak down to the roots. Persimmons have a deep root system and need a head start to grow properly. Water your persimmon trees once or twice a week in spring and summer, depending on the climate in which you live. Water more for hot or dry climates and less for wet climates. Water for ten minutes each time. Water once every two to three weeks in the fall and winter. Fertilize your persimmon tree once a year with one cup of 10-10-10 applied to the base of the tree. Water the tree after you apply the fertilizer to allow it to soak to the roots. Prune your persimmon trees once a year. Trim any over-reaching branches and cut all but one lead at the trunk of the tree. Leave only the strongest branches with about a foot of space between each branch. Remove any dead or damaged branches as they occur. Harvest your persimmons in fall or winter, depending on the variety. Persimmons are ready to harvest when they are fully colored. They will continue to ripen after being picked. 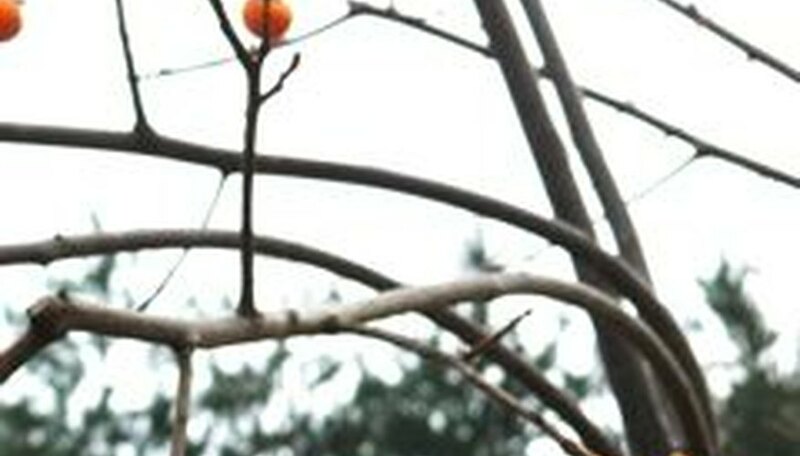 Persimmon trees take between five and seven years to bear fruit. Persimmons come in two types, astringent and non-astringent. Astringent persimmons ripen slower than non-astringent persimmons. Persimmons grow very slowly. Be patient while waiting for the trees to grow. Do not over water your persimmon tree. Root rot may occur. Protect your persimmon trees from extreme cold and heat. A late frost could harm your harvest while a heat spell could sunburn the bark and fruit.